HOW TO CHOOSE-WHICH ONE SHOULD YOU BUY? Monopod vs Tripod. It's an epic battle similar to the Canon Vs Nikon battle that my photography buddy and I always have a lot of fun with. This article will help you choose. You're going to get some tripod and monopod advice based on my experiences with them over the past 45 years (I currently own 2 monopods and 5 tripods). 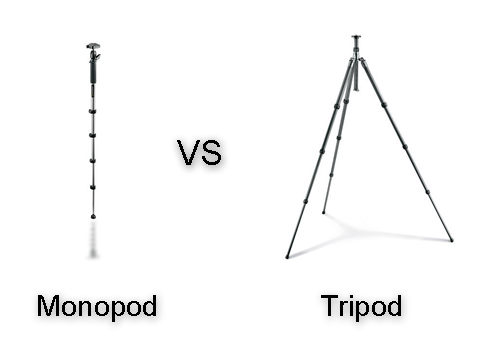 You can do cost and weight comparisons of monopods and tripods. You can look at their portability, stability, versatility and basic functioning. And don't forget to compare the heads that come with them too. That greatly affects their usefulness and price. Then there is always the brand favorite. Many people, including digital photographers, tend to look at the brands of products that their friends tell them about. It is definitely a subjective topic just like your favorite brand of shampoo or toothpaste. 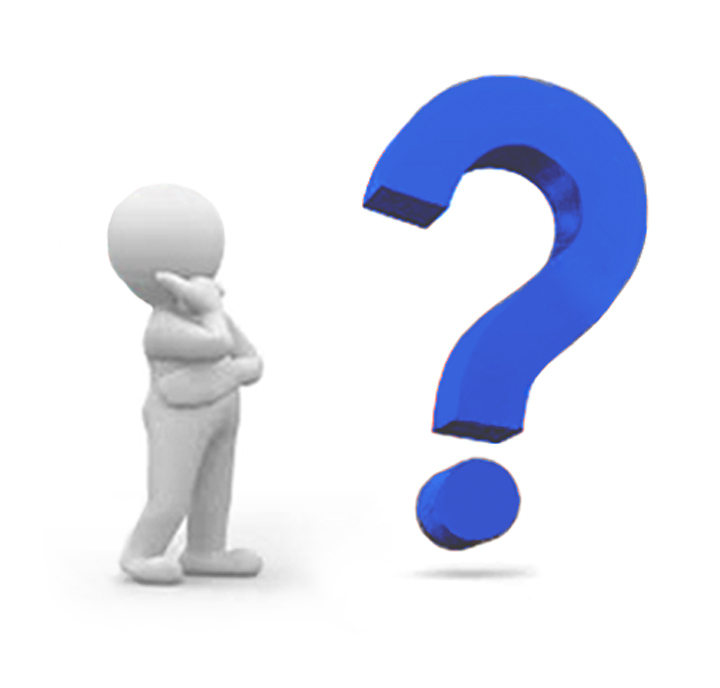 If you are like most people you'd like to buy a monopod or tripod brand that you've heard of. When deciding on automobiles, some guys will never want anything but a Chevy while their neighbor will swear by Ford. Gitzo and Manfrotto monopods and tripods speak of quality just because of the name and if you mention Vivitar or Fotomate your talking about economy buying. There are many manufacturers of monopods and tripods and some are more known for their monopods and some are famous for their tripods. It is real easy to get caught up in the monopod Vs tripod argument and justify which one of these accessories you've used. We all want to feel justified that what we bought was the right choice. I suggest to you that the single most important thing to do first is to consider what kind of photography or video will you be doing. Based on the photography I do personally, I use a tripod about 95% of the time. There are a few certain situations where a monopod is the far better choice for me. Your tripod-monopod using percentage will be quite different than mine. You may really like both a tripod and a monopod at your disposal. Evaluating both monopods and tripods should start with getting a clear understanding of what features and options are available and useful for your photography. Here is an article about the benefits and 3 different options for getting both at the same time: Monopod/Tripod Combo. Whether you choose a tripod or a monopod depends on the type of photography you're doing. Here are some categories of photography and what to consider with each when you play the monopod vs tripod game in your head. You'll find that there are situations when both a tripod and a monopod would work to help you get the results you're trying to achieve. Okay let's dive right in and start with photography where you and your target will often be moving. You have to be mobile and it's got to be easy for you to move and carry your photography gear. Wildlife photography. Wildlife photographers use heavy, long lenses to photograph distant subjects and monopods weigh substantially less than tripods. Monopods are easier to carry when you're hiking distances over rough terrain. Monopods are essential when your target is fast moving. If you are using an extremely long lens and are photographing a stationary subject then a tripod is much better. Here the tripod wins the battle. You want to have deep depth of field. That means a small lens opening and likely longer shutter speeds to get the best exposure. Great landscape photos are often taken before sunrise or after sunset when light levels are low. That's another situation where you're going to have the shutter open longer for the right exposure. 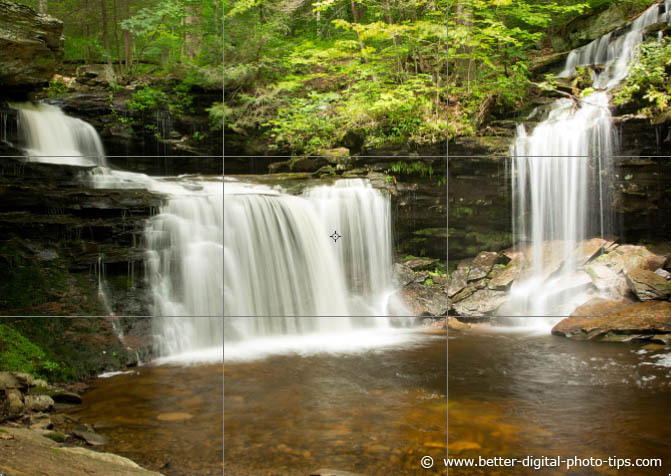 Landscape photography is also about careful composition and framing things in your camera just right. It's helpful to have your camera in a set position so that you can make small adjustments in angles, zoom setting and height. The next time you are watching a professional sporting event on television or live, notice what the professional photographers are using. How many tripods do you see? That would be zero. Tripods take up too much room when you're in a crowd and you can't adjust them fast enough to follow the ever changing action. They're all using monopods. 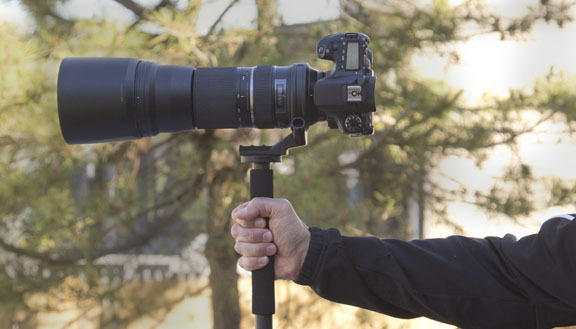 You need to be able to support a long heavy lens. Even if you're not a pro sports photographer, monopods are quicker to adjust position at your son or daughters soccer or baseball game. The tripod legs would interfere with other photographers. You can't move your camera fast enough to follow the high-speed movement of sports when your camera is mounted to a tripod. Monopods are better than tripods for shooting sports. What if you want to shoot video of your child? With video the type of video you are shooting is really the determining factor of whether you should use a monopod or tripod. If your subject is remaining stationary you really want to take advantage of the stability that a tripod will give you. Is there anything more annoying than watching a shaky, bouncing video. The monopod is one of the most simple and under-utilized pieces of photography equipment that a parent can use at their child's sporting event to improve their sports photography and video. On the flip side of that, look at the television cameramen. How many of them are using a monopod? None. Their video cameras are extremely big and heavy and they are staying stationary. No shot of that happening. They either have a heavy duty tripod with sophisticated fluid movement capabilities, or they are a mobile videographer with the video camera on their shoulder. Monopods really are a better choice than tripods when it comes to taking shots of moving objects like bike racers or flying birds or airplanes. Some action photographers would argue that hand held is the only way to go for certain situations. When you are in a really crowded spot among other people, using a tripod is being a space hog, inconsiderate and perhaps even not permitted. Sometimes only a monopod is a possibility. Monopods are extremely useful for shooting video of your child at their concert or play while sitting in your seat. There's nothing more annoying than watch a shaky video bouncing all over the place. 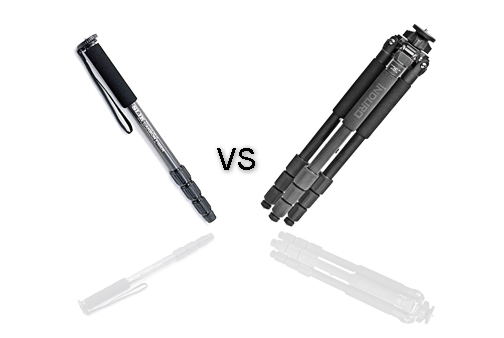 For anyone who has done even a little bit of macro photography, you know the monopod vs tripod battle is a lopsided victory for the tripod. For several reasons a monopod is completely inadequate for close-up photography. Precise composition and focusing constraints require a stationary positioning of your camera that only a tripod can give you. Even the slightest movement of your camera will cause at least some lack of sharpness. Avoid motion blur by using a tripod rather than a monopod in situations like this. 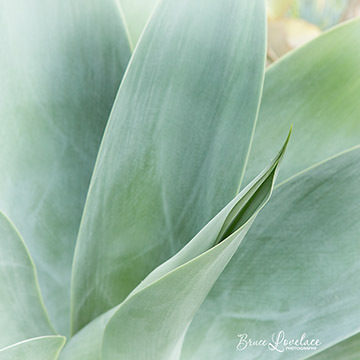 Although it was bright enough in the conservatory to shoot a hand-held photo of this succulent, I chose to use my tripod. I "stopped down" my aperture to a tiny opening to get solid depth of field which slowed down the shutter speed in order to get a good exposure. Some photographers will avoid the monopod-tripod choice by using electronic flash as part of their Macro Photography Equipment. Hand held macro photography is then possible because you stop any motion blur with such a quick exposure and can get great depth of field with a small aperture. 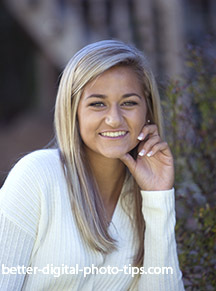 For the majority of portrait photographers a tripod is the right choice, particularly when you're photographing groups. Your tripod will prevent your camera from moving off-target once you've composd your photograph. It is always preferred to have the ability to have direct eye contact with your portrait subjects. You can compose your photo in the viewfinder , and then watch your subjects as you push the shutter button and make the exposure. It is also advantageous to be able make an adjustment in your specific posing or lighting of your subject without having to re-position your camera. Let me tell you though, I like using my monopod when shooting individuals outdoors. I like the really quick mobility I have to make small changes in the position of my camera which, in turn, changes the area behind my subject and I can improve the background that way very effectively. I do occasionally use a monopod when shooting individual portraits when I am low light situations. Motion blur is magnified when you use longer lens settings. I need a little help with stabilizing a long, heavier lens like a 70-200mm f/2.8 lens. When you are doing some night time photography with sharp subjects combined with motion blur, the tripod scores an easy victory over the monopod. Tripods are victorious in the monopod vs tripod battle in night time photography. Photography of the stars often involve exposure times of 30 second or more. 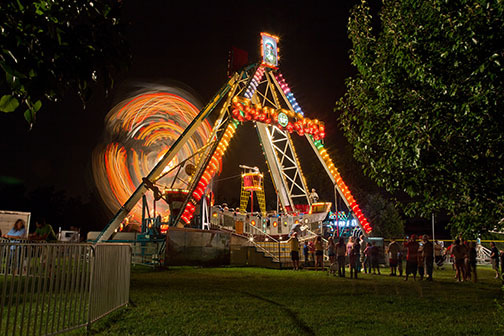 Exposures of 1/15 of a second or longer clearly need the stability of the tripod to get a good nighttime photograph. When looking at the size comparison of a folded monopod vs a folded tripod, it becomes obvious that the monopod will weigh less than a third of the tripod. 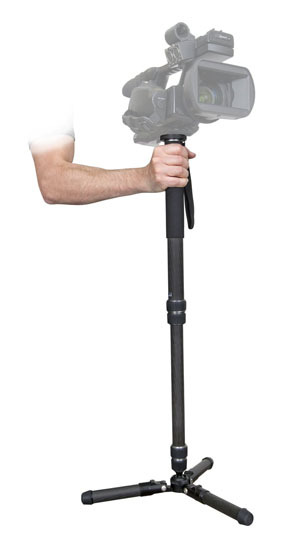 The monopod can also double as a support pole if you enjoy hiking or backpacking. There are many techniques to get your monopod to act like a tripod as well: How to use a monopod. get your camera closer to your subject when you can't get yourself closer. The following video shows a couple of creative and fun uses where the monopod is better suited for use with still photography or videography. In the end, it is the type of photography that is paramount in solving the monopod vs tripod dilemma. Carefully think it out. You really may want to have both a monopod and tripod available to do a variety of photography. Another alternative is the video monopod. Does such a thing really exist? The answer might surprise you in this article: Video monopod. A great way to learn more about the features and options of monopods and tripods is to read the opinions of people who have already purchased them. There are many sources of information about tripod and monopods. One of the sources I rely on to get monopod and tripod reviews is to read them on Amazon. The monopod vs tripod debate will carry on for many photographers, but hopefully this post gave you some insight on when to use tripods and when to use monopods.